HEK293 cells were transfected with vectors encoding HA-SIK1, HA-SIK2 or HA-SIK3 wildtype (WT) or carrying an alanine mutation at the T-loop site. Cell extracts were then blotted using the anti-SIK1 phospho Thr 163 antibody S406D. 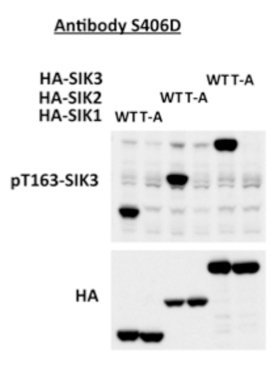 Detected very strongly SIK1, SIK2 and SIK3 wildtype in extracts of HEK293 cells overexpressing wildtype HA-SIK1, HA-SIK2 or HA-SIK3, but not the protein carrying a mutation at the T-loop site. This antibody has not tested on endogenous protein. This antibody cross- reacts with SIK2 and SIK3 and may cross-react with other members of the AMPK family. One should therefore immunoprecipitate the relevant SIK isoform prior to immunoblotting.